December 2, 2018. 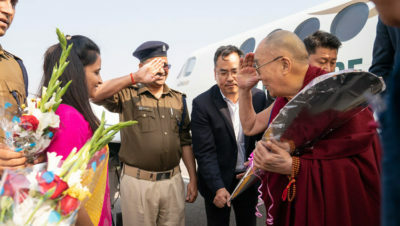 Sankisa, UP, India – This morning His Holiness the Dalai Lama took an early flight from Dharamsala to Delhi and then on to Farrukhabad in western UP. Members of the Youth Buddhist Society of India (YBSI) and officials of the local administration, such as the local MP, the District Magistrate, the Superintendent of Police and the Additional District Magistrate, were present at the airfield to welcome him. From Farrukhabad he drove to Sankisa, which is counted among the eight major Buddhist pilgrimage places in India.It is said that the Buddha reappeared in Sankisa, also known as Sankasya, after spending a rainy season teaching in the Heaven of Thirty-three, where his mother had been reborn. The site was identified and marked by the Emperor Ashoka who had a pillar erected here topped by an elephant capital. Some of that pillar and the elephant capital remain to this day. Sankasya was visited by the Chinese monks Faxian and Xuanzang in the 5th and 7th centuries CE. It was rediscovered in 1842 by General Sir Alexander Cunningham. About 120 volunteers from the YBSI were assembled on the lawn of the hotel where His Holiness is staying to welcome him. He spent a few minutes talking to them. His Holiness asked the volunteers how long they had been sitting waiting. He remarked that it is almost winter when people like to sit and warm themselves in the sun. He posed for photographs with groups of volunteers before going inside. Tomorrow, he will begin teaching Shantideva’s ‘Guide to the Bodhisattva’s Way of Life’.